I just got done playing in and watching the World Pool Series 8-ball event in New York City. What I noticed was that the thing that made the difference between some players still being in the tournament and some not was understanding and adjusting for the 8-ball break. It�s so important in 8-ball, particularly when the format is alternate breaks. Generally, players break from just off the spot to try to make one of the second balls, or from the side cushion to make the 1 ball in the side. The World Pool Series, however, created a box at the head of the table, and players had to break from outside the box. A lot of people weren�t prepared for that. It is a smart rule because it takes away that center break and creates the opportunity for more close matches. With the center break gone, many players reverted to breaking from the side rail. But as you get closer to the rail, the majority of the power from the cue ball is transferred to fewer balls in the rack. Because they were using a standard triangle and the balls weren�t always frozen, the results were sporadic. You may get the 1 ball into the side pocket, but the spread of balls was not as wide. The players who enjoyed consistent success broke from the very edge of the box because it allowed for the best transfer of energy from the cue ball through the rack. 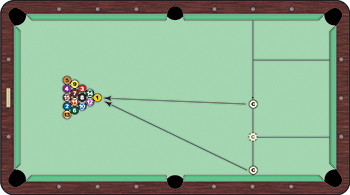 The diagram shows one break shot from the center of the table and one from the rail. Assuming you hit the 1 ball flush on the break, you can see that the majority of the power when breaking from the side runs directly through the 1, 14, 3, 9 and 5. There is very little energy transferred from the 1 to the 12, from the 14 to the 8, from the 3 to the 7 or from the 9 to the 4. Conversely, when you break near the spot, energy is transferred almost equally through the entire rack. The 1 is going to catch more than 50 percent of the 12. Obviously, the more energy that is transferred through the mass of the rack, the better and more effective spread you are going to get on the rack. That�s why most guys where breaking from the corner of the box (dotted cue ball). It gave them the most solid hit on the 1 and the best reaction through the rack.